Key Takeaway: Russia is accelerating its efforts to subvert the Syrian political process by establishing a new diplomatic framework that sets conditions to expel the U.S. from Northern Syria. Russia announced its intent to host delegates from all major opposition, ethnic, and tribal factions at a “Syrian Congress on National Dialogue” in Sochi on November 18. Russia may exploit the conference to broker a wider reconciliation deal between the Bashar al Assad Regime and the Syrian Kurdish YPG under conditions that preclude long-term U.S. influence in Syria. Russia will reportedly host a political conference called the “Syrian Congress on National Dialogue” in Sochi on November 18. Russian media claims that the conference will include up to 1,500 participants representing major political and armed opposition groups, local councils, tribal gatherings, and various factions of Syrian Kurds. The Russian Foreign Ministry published an official list of invitees that includes the Syrian Kurdish Democratic Union Party (PYD) and its rival Kurdish National Council (KNC); the exiled High Negotiations Committee (HNC) backed by Saudi Arabia and the Bashar al Assad regime-tolerated Moscow and Cairo Platforms; and armed anti-Assad opposition groups including the Southern Front. It remains unclear which if any of these groups will attend the conference, although the public invitations are likely intended to signal inclusiveness. Syrian Ambassador to the UN Bashar al-Jaafari also stressed the Assad regime’s willingness to participate. Russia will reportedly use the venue to propose constitutional reforms, the formation of a transitional government that retains Syrian President Bashar al-Assad, and new municipal, parliamentary, and presidential elections for Syria by 2021, according to unidentified sources familiar with the conference. The conference, if successful, will undermine or coopt international efforts to reach a political settlement to the Syrian Civil War. Russia has used alternative diplomatic venues - such as the trilateral Astana Talks with Turkey and Iran - to capture and shape the UN Geneva Process. Russia uses these measures to demonstrate its legitimacy as an international arbiter while simultaneously ensuring a favorable political outcome that preserves its interests in the Syrian Civil War. Russia could also use the conference to broker a deal with the Syrian Kurds at the expense of the U.S. in Northern Syria. Russia is reportedly prepared to offer federal status to the Syrian Kurds in exchange for their wider reconciliation with the Assad Regime. The Syrian Kurdish PYD has previously been barred from participation in political negotiations at the Geneva Talks at Turkey’s insistence. Russia reportedly excluded Turkey from active participation in the Syrian Congress on National Dialogue - likely to encourage meaningful engagement by the Syrian Kurds. The outcome of these negotiations could include an agreement that constrains or ultimately expels the U.S. Anti-ISIS Coalition from Northern Syria. Russia has recently deepened its increased cooperation with the Syrian Kurdish PYD to assert itself as a viable partner ahead of the Syrian Congress on National Dialogue. The Russian Armed Forces reportedly assumed full control of the Menagh Military Airbase north of Aleppo City on October 27 following a withdrawal by the Syrian Kurdish YPG. Russia previously deployed military personnel to Menagh Airbase and nearby Tel Rifaat on October 20 to preempt military operations by Turkey against the majority-Kurdish Afrin Canton in Western Aleppo Province. Russian Deputy Foreign Minister Mikhail Bogdanov also met with officials from the Syrian Kurdish PYD in Qamishli in Hasaka Province on October 18 to discuss Syria’s future political outcome. Russian Senator Ziad Sabsabi conducted a near-simultaneous visit to Qamishli in coordination with the Russian Ministry of Defense to secure the release of twenty-one Russian Chechens and Dagestanis from Afrin Canton. Russia has also mounted long-standing efforts to generate a unified bloc of Syrian Kurds. Russian Gen. Alexander Dvornikov hosted a conference for representatives from 24 Syrian Kurdish political parties - including the PYD and KNC - at the Hmeymim Airbase on the Syrian Coast in December 2016. Russia nonetheless faces challenges from its partner in the Assad Regime. Assad reportedly rejected calls to consider federalism and favorable constitutional reforms for the Syrian Kurds by Russia in October 2016. The upcoming Syrian Congress on National Dialogue in Sochi will likely encounter similar hurdles. Russia nonetheless stands to use its leadership of the political process to further subvert the future influence of the U.S. in Syria. Key Takeaway: Russia has likely exploited recent tensions between Hungary and Ukraine to support its campaign to drive a wedge between Ukraine and its neighbors. The Kremlin has also revived its subversion in Western Ukraine focusing on minorities’ autonomy issues. It is unlikely that the Kremlin intends to create an insurgency there as it did in Eastern Ukraine, but it may create another fissure that destabilizes Kyiv. The Kremlin is also likely to attempt to stoke tensions between Ukraine and its other neighbors with minorities in Western Ukraine, such as Poland. The U.S. must watch these trends, which are likely to be slow-burning and subtle. They have implications for Ukraine’s stability and provide insight into Russia’s evolving methods of irregular warfare. o Ukraine passed an educational bill that mandates the use of the Ukrainian language in schools on September 25.
o Nationalists in Hungary, which shares a border with Ukraine, condemned the bill for infringing upon the rights of 150,000 Hungarians in Western Ukraine’s Zakharpatiya (Trans-Carpathia) region. Hungary’s Russia-linked extreme nationalist Jobbik party participated in a rally calling for the self-determination of Zakharpatiya in Budapest on October 13.
o The Hungarian government threatened to halt Ukraine’s integration with the EU, though it received no support from key EU states. It also blocked the next Ukraine-NATO Commission meeting on October 27.
o Hungarian Prime Minister Victor Orban also has a relatively strong relationship with Russia. Hungary is the only EU country Russian President Vladimir Putin visited twice in 2017. The Kremlin also agreed on a $12 billion nuclear plant modernization project in Hungary planned for early 2018.
o Other Eastern European countries with ethnic communities in Ukraine criticized the bill but did not take as confrontational a stance as Hungary. o Although Ukraine and Hungary might have come to a compromise, the Kremlin intervened and set conditions to exploit this vulnerability in the future. o The Russian media created false narratives that dramatically overstated the aspirations of Hungarian minorities to gain autonomy. Two notable disinformation campaigns included reports about the Ruthenes, another ethnic group in Zakharpatiya, holding a congress demanding their autonomy in March 2015. Another Russian media campaign claimed that Rusyn and Hungarian communities of Zakharpatiya held a congress in Budapest, where they allegedly called for the federal status of their region in August of 2015. The respective communities’ leaders have debunked both Russian narratives. o The Kremlin likely attempted to build local organizations to use as a subversion tool. The Security Service of Ukraine (SBU) issued a warning to the Zakarpatiya Regional Organization for the Protection of Workers Rights about its potential criminal liability for encroachment on the territorial integrity of Ukraine in July 2015. The organization, registered only one month earlier, promoted the idea of a special self-governing territory for Hungarian minorities as being essential for ensuring workers’ rights. Local investigative journalists soon exposed the organization’s connections to Russia, and the SBU’s warning followed shortly thereafter. Russia may have exploited the recent tensions between Ukraine and Hungary to revive its subversion efforts on Ukraine’s Western border. o Jobbik called for the autonomy of Hungarian minorities in Western Ukraine. Jobbik reportedly organized a “Zakharpatiya self-determination” rally in Budapest on October 13, calling for the autonomy of the region. News reports showed some of the participants holding signs reading “Hungary wants Transcarpathia back!” Jobbik renewed its push for a regular all-Hungarian roundtable on the Transcarpathian issue on September 29. Jobbik promised to launch a significant “struggle for the autonomy of Hungarian communities living abroad” within the context of its election campaign. Both Jobbik and Hungary’s ruling nationalist Fidescz party are likely to use the issue of Hungarian minorities abroad to gain political capital ahead of Hungary’s 2018 elections. o The Kremlin launched a media operation to amplify Hungarian nationalist criticism of the Ukrainian educational bill. The Hungarian Government threatened to ask the EU to revise its association agreement with Ukraine, and strongly condemned the bill. Poland, Romania, and others with ethnic communities in Ukraine criticized the bill but did not further press their concerns. Polish officials stated on October 23 that they do not view the bill as a threat and that minority groups should be able to know both Ukrainian and Polish languages. Ukrainian Foreign Minister Pavlo Klimkin stated that Ukraine and Hungary found a compromise and will cooperate on the execution of the law on October 19. Nevertheless, the Hungarian government escalated by blocking the next Ukraine-NATO commission meeting on October 27. Russian propaganda boosted the Hungarian nationalist narrative and continued to frame Ukraine as an oppressor of minorities, suggesting that Ukraine is about to lose additional territory and push away its European and NATO partners. o The Russian media campaign is also likely targeting Hungarian minorities in Ukraine to inflame ethnic tensions. The Russian media narratives warn of alleged Ukrainian repressions against ethnic Hungarians in Western Ukraine, which greatly resembles Russia’s propaganda in Ukraine’s Donbas region. The Kremlin is likely pursuing a broader campaign aimed at driving a wedge between Ukraine and its European neighbors. Ukrainian authorities arrested a group of saboteurs on October 2 who were attempting to destroy a Hungarian monument in Zakharpatiya. Ukrainian Interior Minister Arsen Avakov stated the detained individuals were connected to the defunct pro-Russia Party of Regions in Ukraine. Avakov stated that the gang was responsible for at least eight other incidents intended to inflame tensions between Ukraine and EU in 2016-2017. Earlier in 2017, for example, protest participants claimed that Russia-backed elements paid them to instigate anti-Polish Ukrainian nationalist protests at the Polish embassy in Kyiv on July 7. It is unlikely that Russia intends to or is able to create a Donbas-like insurgency in Zakharpatiya. This Western Ukrainian region has strong pro-Ukrainian sentiments, small minority communities, and other differentiating factors. However, sustained Russian subversion may create another destabilization problem for Kyiv to solve. Growing pre-election rhetoric from Hungarian nationalist parties about protecting Hungarians abroad has amplified the Kremlin’s continued cultivation of minorities’ self-determination and autonomy movements. The Kremlin’s information operations in turn amplify Hungarian messaging. The cumulative effect may lead to more discussions about special status for the region and, potentially, to a referendum in the longer term. Kyiv’s increased focus on its own 2019 elections and the continued war in Eastern Ukraine may prevent the Ukrainian government from allocating necessary resources to address underlying concerns in Zakharpatiya and otherwise resisting Russia’s subversion. The complexity of the situation may allow Russia to effectively conceal its hand and portray any escalation as indigenous confrontation between ethnic groups within Ukraine or Ukraine and its neighbor. Additional destabilization may stretch Kyiv’s already thin resources and damage Ukraine’s relations with its European partners. Finally, the Kremlin’s reinforcement of regional self-determination narratives and the rhetoric about protecting minorities abroad among Eastern European states helps Russia legitimize its own expansionist actions, which it claims are motivated by its desire to “protect” Russian minorities. Key Takeaway: Iraq and Iran rejected a Kurdish ceasefire offer and launched a new phase of their military campaign against Iraqi Kurdistan. Iraqi forces and Iran’s proxies are prepared for new military operations to seize Iraqi Kurdistan's border crossings if Kurdish forces do not relinquish them. Iranian proxy leaders are coordinating with Iraqi Security Forces (ISF) commanders and may even direct the military operation, if it occurs. It will begin at the Fishkhabur crossing between Iraqi Kurdistan and Syria, where Iran's proxies including the Badr Organization and Asa'ib Ahl al Haq are deployed. Negotiations are underway after Prime Minister Abadi set a deadline for the handover of the crossings on October 28th, but there has been no sign of a Kurdish withdrawal. Kurdistan Regional Government President Masoud Barzani announced he will not seek an extension of his term past November 1st in a letter to the Kurdish Parliament on October 29th. 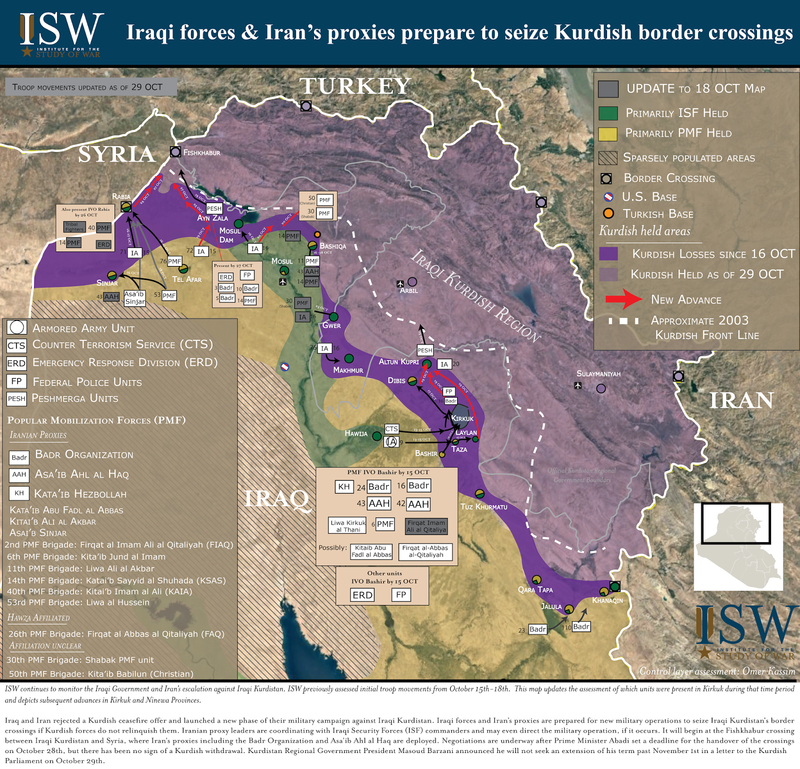 Iraqi forces and Iran’s proxies are prepared to launch operations to seize Iraqi Kurdistan’s border crossings if Iraq’s Kurds do not surrender them to federal control. Prime Minister Haider al Abadi gave Iraq’s Kurds until 1:00 on October 28th to allow a “joint technical committee” to assume control of the border crossings. Negotiations are underway between the Iraqi government and Kurdish forces. Abadi is prepared to take the crossings by force if negotiations fail. Abadi rejected a previous Kurdish offer for a full ceasefire and return to political negotiations while en route to Tehran on October 26th, reiterating his demand for the full cancellation of the Kurdish referendum outcome and the handover of all border crossings and airports to federal control. His subsequent focus on border crossings likely indicates he is continuing to proceed in stages to compel Iraqi Kurdistan to accept his demands, and that he has Iranian support for a military offensive along the border. Iraqi forces and Iran’s proxies set conditions from October 24th – 27th for operations to seize the border crossings, starting with the border crossing with Syria at Fishkhabur. The combined forces deployed on two axes from the Rabia border crossing and Zumar district south of Rabia. Iran’s proxies on this front include forces from three brigades of the Badr Organization as well as units from Asai’b Ahl al Haq and Katai’b Sayyid al Shuhada. Iranian proxy leaders are coordinating with Iraqi Security Forces (ISF) commanders and may even direct the military operation. 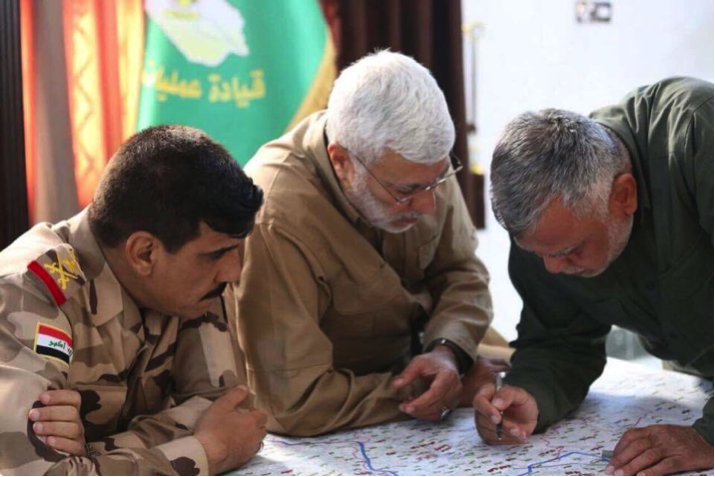 Badr Organization leader Hadi al Ameri, Kitai’b Hezbollah and Popular Mobilization Committee leader Abu Mehdi al Muhandis, and Iraqi Security Forces Joint Operations Command deputy leader General Yarallah discuss military operations against Iraqi Kurdistan on October 27th. Abadi also secured Turkish support for continued operations against Iraqi Kurdistan during a visit to Ankara on October 26th. Abadi and Turkish Prime Minister Recep Tayyip Erdogan also agreed to create a new Iraqi-Turkish border crossing northeast of Fishkhabur, presumably after Iraqi forces and Iran’s proxies seize the area from Iraq’s Kurds. Internal disruption in Iraqi Kurdistan could preclude a peaceful handover of the crossings. Kurdistan Regional Government President Masoud Barzani announced he will not seek an extension of his term past November 1st in a letter to the Kurdish Parliament on October 29th. He recommended that his presidential powers be divided between the Kurdish government, parliament and judiciary while he “[continues] to serve Kurdistan as a Peshmerga.” Early reports indicate that pro-Barzani supporters stormed the parliament in Arbil while it met to discuss Barzani’s resignation. It is unclear how the political situation in Kurdistan will affect the ongoing negotiations for the surrender of Kurdistan’s border crossings. Escalating intra-Kurdish tensions could preclude a peaceful handover to the Iraqi government and Iran’s proxies. The U.S. is refusing to acknowledge Iran’s role in the military campaign against Iraqi Kurdistan. U.S. officials have legitimized Iran’s power play in Iraq by denying the role of Iran’s proxies in Abadi’s operations, beginning in Kirkuk. Abadi declared his intent to disarm Iran’s proxies in interviews with Western press on October 25th in an effort to reaffirm his alignment with the U.S. Rhetoric and action differ. An unnamed, senior U.S. official stated on October 27th that Abadi has not yet asserted his authorities over Iran’s proxies. Iran’s proxies are gaining further leverage over Abadi. The U.S. must begin to separate rather than tolerate the intertwinement of ISF and Iranian proxies. 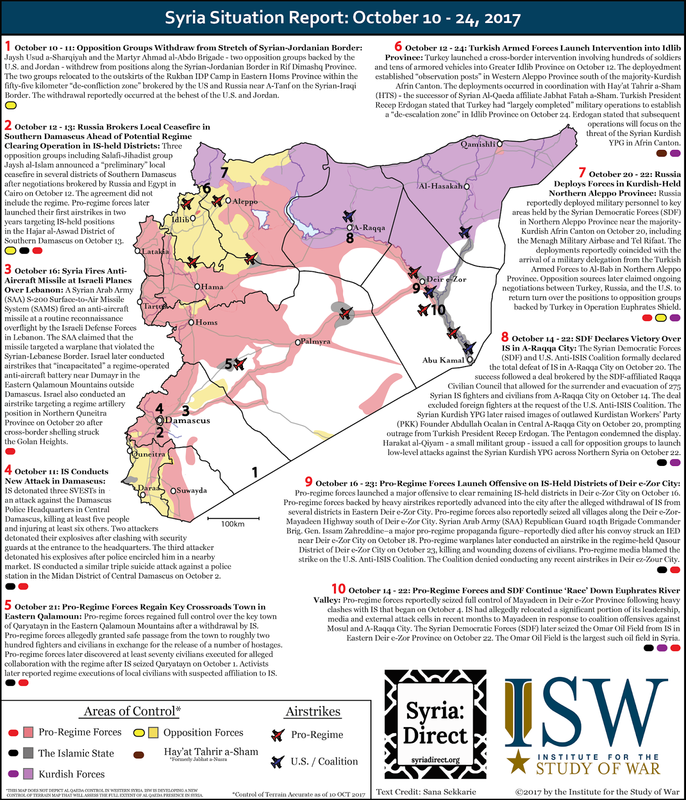 Key takeaway: The US-led campaign against ISIS achieved a major victory in Raqqa, but post-ISIS conflict in northern Syria remains likely due to the dominant role of the Syrian Kurdish YPG in the Raqqa operation and its commitment to shaping post-ISIS governance in accordance with the vision of PKK founder Abdullah Ocalan. Russia, Iran, and the Syrian regime are meanwhile preparing to cut a deal with the YPG for the future governance of northeastern Syria, which could oust the U.S. Turkey is exploiting US calls for action in Idlib to establish military positions in the province that posture Turkey for future confrontation against the YPG to the north. Turkey is not meaningfully constraining al Qaeda. In Iraq, the Kurdish retreat across Iraq's disputed internal boundaries could destabilize northern Iraq rather than unify the country if Kurdish civilians now under the control of Iraqi forces and Iran's proxies turn to violence. Early indications of civil unrest have already emerged. The Kurdish retreat is nonetheless a political win for Prime Minister Abadi and a military win for Iran, whose proxies are now consolidating control over formerly contested cities and advancing further into northern Iraq. Raqqa fell, but under conditions that favor continued insurgency. The US announced the Syrian Democratic Forces (SDF) seized the last pocket in Raqqa City held by the Islamic State of Iraq and al Sham (ISIS) on October 20th. 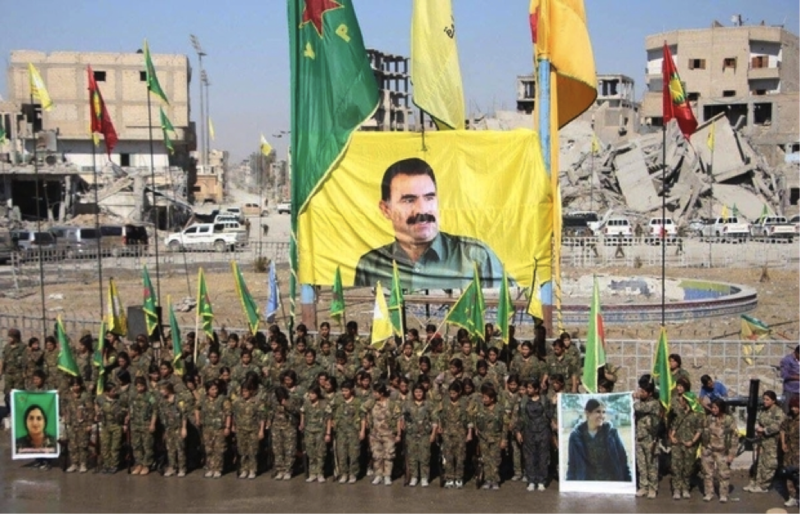 Syrian Kurdish People’s Defense Forces (YPG) exploited the victory for political gain. A large contingent of female Kurdish (YPJ) fighters held a photo shoot in Raqqa’s central roundabout with massive YPG/YPJ flags and a large photo of PKK founder Abdullah Ocalan on October 19th. YPG forces also reportedly arrested Arab fighters flying Syrian revolutionary flags in Raqqa City. This could be an isolated incident, but the YPG’s clear effort to dominate the narrative after defeating ISIS in Raqqa city will drive support for Sunni Arab resistance against the YPG. The U.S.-led anti-ISIS coalition has recruited and trained 1,600 fighters in a “Raqqa Internal Security Force” to provide security in Raqqa after its recapture. It is unclear how much military training these forces received from the coalition, however. They will likely depend on continued YPG support to defend Raqqa against infiltration and spectacular attacks by ISIS and possibly al Qaeda. Female YPJ units pose for a photo shoot honoring PKK founder Abdullah Ocalan in Raqqa City on October 19th. Pro-regime forces seized Mayadin, the headquarters of ISIS senior leadership & external operations. Pro-regime forces claimed to seize the city on October 14th, although it is unclear whether ISIS withdrew preemptively. ISIS leader Abu Bakr al Baghdadi and other ISIS senior leaders, including external operators, had reportedly relocated to Mayadin from Mosul and Raqqa in late 2016 and early 2017. They most likely relocated to Abu Kamal IVO the Syrian-Iraqi border. Pro-regime forces are now positioned to disrupt further SDF movements along the Middle Euphrates River Valley (MERV) southeast of Raqqa City. Turkey deployed to Idlib, but in coordination with al Qaeda. Turkish armed forces deployed to multiple locations in northern Idlib Province beginning on October 13th in accordance with an agreement with Hayat Tahrir al Sham (HTS), the successor of al Qaeda’s Syrian affiliate. Turkey is exploiting US calls for Turkish action to constrain al Qaeda-held in Idlib and is instead posturing against the YPG, which holds a “canton” north of Idlib Province. Turkey’s deployment to Idlib positions Turkish troops on a second flank of the Kurdish canton, setting conditions in Turkey’s favor for future confrontation. Turkey is also positioning its troops as potential guarantors of its de-escalation agreement with Russia and the Syrian regime Idlib Province. Turkey’s deployment does not meaningfully constrain al Qaeda, and instead limits U.S. options in Idlib Province. Unconfirmed reports indicate Turkey has offered to help provide targeting intelligence to the U.S. to eliminate high value al Qaeda leaders. High value target (HVT) strikes in Idlib could degrade senior al Qaeda leadership in Syria, but will not reverse al Qaeda’s ongoing and successful efforts to embed within Syrian society in Idlib and to govern through a network of local affiliates and proxies. Peshmerga forces collapsed across most of the front line in Iraq’s Disputed Internal Boundaries, ceding terrain to ISF and Iranian proxies. The Kurdish retreat empowers Iran and could destabilize northern Iraq rather than unify the county. Iraq and Iran, through Qassem Soleimani and Badr Organization leader Hadi al Amiri, demanded a Kurdish withdrawal from areas seized since 2014, starting with Kirkuk. The Kurdish retreat is a win for both the central Iraqi government and Iran, whose proxies have seized new key terrain and consolidated control over previously contested cities. Iran has downplayed the role of its proxies in order to legitimize them as instruments of the Iraqi state. Western media coverage and statements from US officials have assisted Iran with this deception by denying the role of Iran's proxies in Kirkuk. 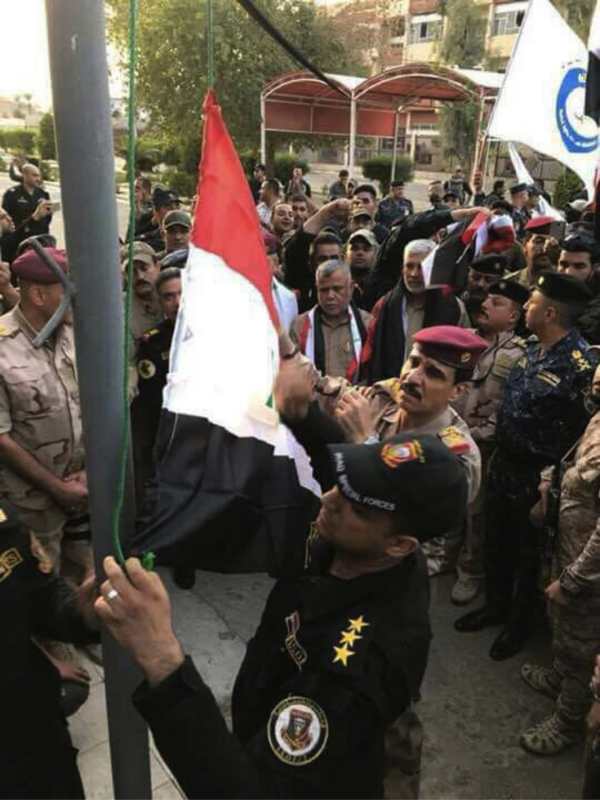 Two Iranian proxy leaders – Hadi al Ameri and Abu Mehdi al Muhandis – participate in a flag raising in Kirkuk City along with leadership of the Iraqi Counterterrorism Services (CTS) on October 16th. Iraqi forces began to push farther north on 20 OCT, raising fears of a push into Iraqi Kurdistan beyond the 2003 Kurdish front line. Iraqi Counter Terrorism Services (CTS) and unspecified other Iraqi Security Forces (ISF) seized Ton Kubri, ten kilometers north of Dibis, Kirkuk Province and 40 KM southeast of Arbil, after clashing with Peshmerga forces. Kurdish populations now under the control of the Iraqi government and Iran's proxies may drive an insurgency. Civil unrest against Iraqi forces and Iran's proxies began in Kirkuk and Khanaqin on October 18th. Prime minister Abadi reportedly ordered a handover of security in Kirkuk to local police, and early reports indicate Iraqi forces and Iran's proxies may have drawn back from Khanaqin in northern Diyala. It is unclear whether these withdrawals will pacify the Kurdish population. *A previous version of this post incorrectly referred to Iraqi Kurdish concerns over an advance past the 2014 front line. Iraqi forces had already breached that front line on October 16, 2017 and began to push to the front line of the Kurdistan Regional Government's formal boundaries on October 18, 2017. A collapse of the Iraqi Kurdish Peshmerga under joint pressure from Iraq and Iran shortly after the Kurdish independence referendum on September 25, 2017 empowers Iran and could destabilize northern Iraq rather than unify the country. Iraqi Kurdish Peshmerga forces withdrew from disputed areas across northern Iraq on October 16th and 17th, 2017. A combined force of Iraqi Security Forces and Iranian proxies gathered south of Kirkuk starting on October 13th in order to compel Iraqi Kurdistan to relinquish control of the oil-rich city. The combined ISF-proxy force moved in to secure the city as well as nearby military bases and oil fields on October 16th after the Peshmerga abandoned their positions. Peshmerga forces also withdrew from areas in Ninewa, Salah al Din, and Diyala Provinces. The Iraqi Government and Iran likely signaled their intent to use military force to compel the Peshmerga withdrawals in those provinces, if necessary. The Kurdish retreat is a win for both the central Iraqi government and Iran, whose proxies have seized new key terrain and consolidated control over previously contested cities. Iran has downplayed the role of its proxies in order to legitimize them as instruments of the Iraqi state. Western media coverage and statements from US officials have assisted Iran with this deception by denying the role of Iran’s proxies in Kirkuk. 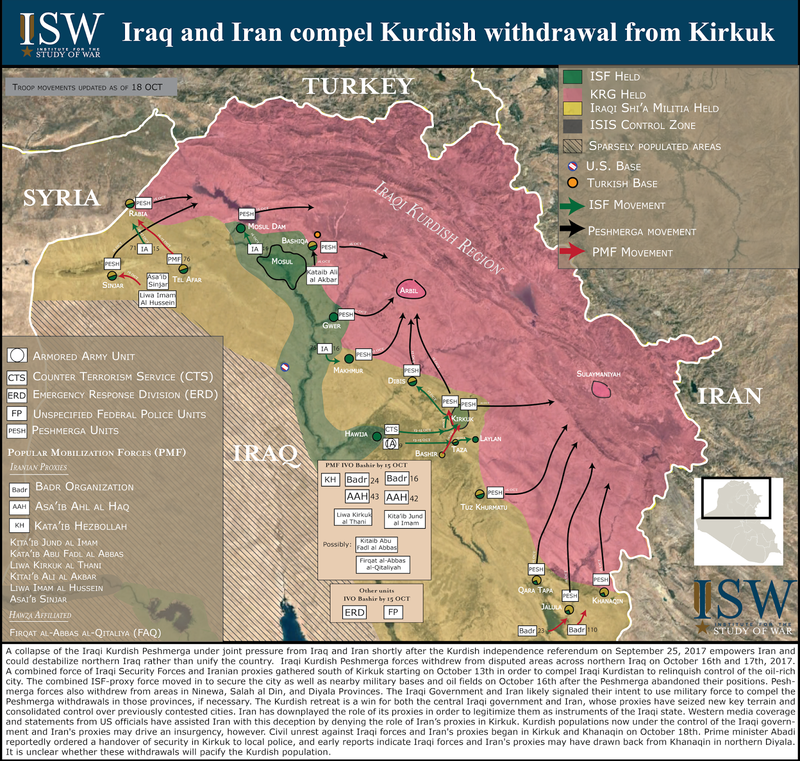 Kurdish populations now under the control of the Iraqi government and Iran's proxies may drive an insurgency, however. Civil unrest against Iraqi forces and Iran's proxies began in Kirkuk and Khanaqin on October 18th. Prime Minister Abadi ordered a handover of security in Kirkuk to local police, and early reports indicate Iraqi forces and Iran's proxies may have drawn back from Khanaqin in northern Diyala. It is unclear whether these withdrawals will pacify the Kurdish population. Russia renewed its violent, indiscriminate air campaign against civilians in Western Syria in order to coerce groups opposed to the Bashar al-Assad regime to accept a ceasefire or ‘de-escalation zone’ in Idlib Province. Russia shifted its air campaign to target rebel-held terrain in Idlib and Hama Provinces following an offensive launched by Hay’at Tahrir al-Sham (HTS) – the successor of Syrian al Qaeda affiliate Jabhat Fatah al-Sham – in Northern Hama Province on September 19. The Russian Ministry of Defense launched an immediate disinformation operation to present this shift in its air campaign as a legitimate series of strikes against extremist groups attempting to disrupt a ‘de-escalation zone’ in Idlib Province brokered by Russia, Turkey, and Iran on September 15. Russia nonetheless mounted a systematic campaign of airstrikes against civilian infrastructure – including hospitals, schools, power stations, and mosques – as well as former U.S.-backed rebel groups unaffiliated with HTS or al Qaeda. The strikes marked a return to the widespread punitive air campaigns Russia previously directed against opposition-held terrain across Western Syria. Russia also employed advanced weapons systems to further inflict violence against Idlib Province under the guise of counter-terrorism operations. The Russian Black Sea Fleet’s Permanent Mediterranean Task Force launched Kalibr cruise missiles targeting Ma’arat al-Numan in Southern Idlib Province on September 22. Russia Tu-95MS ‘Bear’ strategic bombers later launched Kh-101 cruise missiles targeting the outskirts of Idlib City on September 26. Russia’s deliberate use of violence against civilians precludes any legitimate, Russian-enforced ‘de-escalation’ zone in Idlib Province. Russia also leveraged its ongoing air campaign to co-opt Turkey away from the U.S. and NATO in order to further set conditions for the planned ‘de-escalation zone’ in Idlib. Russia concentrated its airstrikes in areas of Western Idlib Province along the Syrian-Turkish Border from September 25 - 30. The Russian Air Force likely sought to interdict the movement of HTS and opposition forces ahead of a Turkish Armed Force (TSK) deployment into Idlib by targeting rebel-held areas connecting Western Aleppo Province to the Bab al-Hawa Border Crossing on the Syrian-Turkish Border as well as key supply routes around Idlib City. Turkish President Recep Erdogan subsequently announced the start of cross-border operations to implement the Idlib ‘de-escalation zone’ on October 7. Erdogan stated that Russia would support his intervention. The TSK began deployments to observation positions in Northern Idlib Province near the majority-Kurdish Afrin Canton on October 12 following earlier reconnaissance missions. Russia likely perceives an opportunity to exploit widening diplomatic fissures between the U.S. and Turkey. Russia could thus attempt to use the ‘de-escalation zone’ to compel Turkey into deeper – albeit temporary – cooperation with Russia in Northwestern Syria at the expense of the United States.